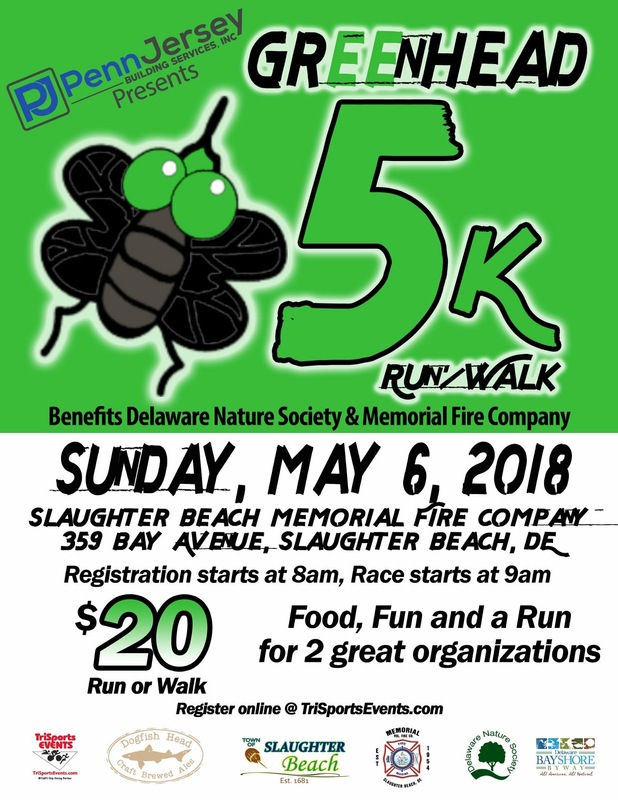 Slaughter Beach is hosting the first annual “Running from the Greenheads” 5K on Sunday, May 6, 2018, to benefit the Slaughter Beach Memorial Fire Company and the Delaware Nature Society. The theme celebrates the town’s annual visitors, the infamous Greenhead Flies, and just as the theme suggests we hope this will be a slightly off-center, fun, family function. 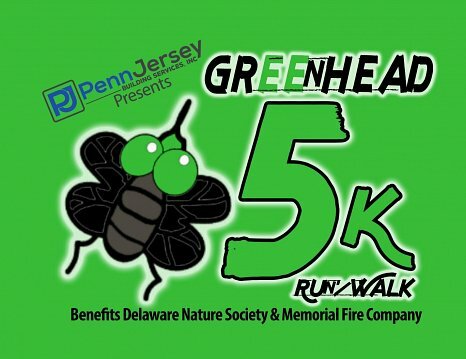 The event is a collaboration between the Town, the Delaware Nature Society, the Memorial Fire Company, the Delaware Bayshore Byway and DelDot Principal sponsors are Penn-Jersey Building Services, Inc., Dogfish Head Brewery, Comcast and Park Place Restaurant & Lounge. Planning for the event began in earnest after the Christmas Day fire when several residents (who shall remain nameless for their own protection) decided that this could be a fun and amusing way to show our appreciation to the more than 130 fire fighters who gave up their Christmas dinners to protect the Town. The race is produced by Tri-Sports Events. Registration fees are $20 until April 29th. Register at TriSportsEvents.com. Event day registration starts at 8:00 a.m. at the Memorial Fire Company. Healthy Kids Run begins at 8:50 a.m., and the 5K begins at 9:00 a.m. Runners will receive food items, t-shirts, fly-related paraphernalia and those over-21 will be treated to a selection of Dogfish Head goodies.Â We’ll have a corn hole game, horseshoes, giant Jenga, sidewalk tic-tac-toe, video games, and a bounce house at the pavilion, and starting at 1:00 p.m., the Reunion, a classic rock and soul band will kick off the after-the-race festivities. The Memorial Fire Company Ladies Auxiliary will sell hamburgers, hot dogs, fries, sodas, water and Dogfish Head beer. The 5K course is an out-and-back route that takes participants from the fire department north to Beach Plum and back. We are asking for volunteers to help direct parking, assist with traffic control, hand out food packs and tee-shirts for the runners, or assist Tri-Sports with registration. If you can’t volunteer, then we hope you come out and cheer on the runners and for those living on the route, we invite you to compete for the trophy for “Water Stop” If you can’t participate but would still like to donate, log onto TriSportsEvents.com. Please contact Kathy Lock to sign up (email: kmlock@comcast.net or telephone 422-5234). On the morning of the event, please consider using Slaughter Beach Road to enter or exit the beach and we’ve received a permit to close the east (bay) side of Bay Avenue from the Fire Company to Beach Plum to ensure the safety of the runners. We anticipate that the road will be reopened by 11:00 a.m. For the residents who live along the route, we appreciate your patience. If you must use your car, please keep a lookout for stray runners/walkers. Above all, we hope that runners and residents alike find this to be an enjoyable day at the beach.